Safety should be the most important consideration when working in any garage – domestic or commercial. One thing that can pose a serious hazard is a vehicle that starts rolling or moving when you’re working on it. But you can avoid this from happening with a set of wheel chocks. SGS Engineering offers a range of vehicle wheel chocks for sale, and these can be used with cars, trailers, caravans, vans, motorbikes and motorhomes. Buy a quality set of wheel chocks, and you can rest assured the vehicle you’re inspecting or repairing won’t move when you least expect it. Our wheel chocks are an affordable, yet highly effective way to keep your garage or workshop safe. By placing them directly under the wheels of the vehicle you’re working on, you can stop any unsafe and unwanted movement. Made from durable rubber or steel, wheel chocks are an incredibly tough addition to your garage. The SGS range of wheel chocks includes various size options, depending on what vehicles you work on. From our heavy-duty motorcycle front wheel support chock to our extra-large rubber wheel chocks for vans, trucks or 4x4s, these products can even prevent a vehicle from moving on a slope or gradient. Why take risks with your safety? Explore our wheel chocks range today. Why choose SGS for your wheel chocks? All wheel chocks from SGS come with a free two-year warranty as standard, which means you can be sure we’re taking your garage safety seriously. If you have any questions or you’re not sure which vehicle wheel chocks you need, our team will be more than happy to help. 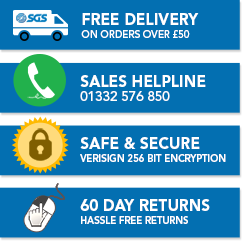 Just call us on 01332 576 850 or drop us an email at sales@sgs-engineering.com. Need your steel or rubber wheel chocks in a hurry? Order before 4pm on a weekday and you’ll be able to benefit from our free Next Working Day delivery service, because safety shouldn’t be left to chance. Not satisfied with your purchase for whatever reason? No problem! Just return it within 60 days of delivery for a full refund under our no-quibbles return policy. Wheel chocks aren’t the only piece of garage equipment that help to make your garage safer to work in. But it’s important to get the equipment that’s right for you, and that’s where we’re able to help. Our team has produced a number of helpful how-to guides to point you in the right direction with your next garage equipment purchase. Chocks to Jacks to Creepers - You’ve chosen your chocks, but what else do you need? Got a jack? Or your creepers? Read this guide to find out. Get Started With Car Maintenance - Looking after your car doesn’t have to difficult – our handy guide can get you started. How to buy the right trolley jack - SGS offers different types of trolley jacks to suit a range of needs. Find out yours here.